At the recent SIAM conference on Parallel Processing for Scientific Computing, I met my friend Tim Davis. Tim is a professor at the University of Florida, a consultant to MathWorks, and author of many of the functions involved in MATLAB sparse matrix calculations. 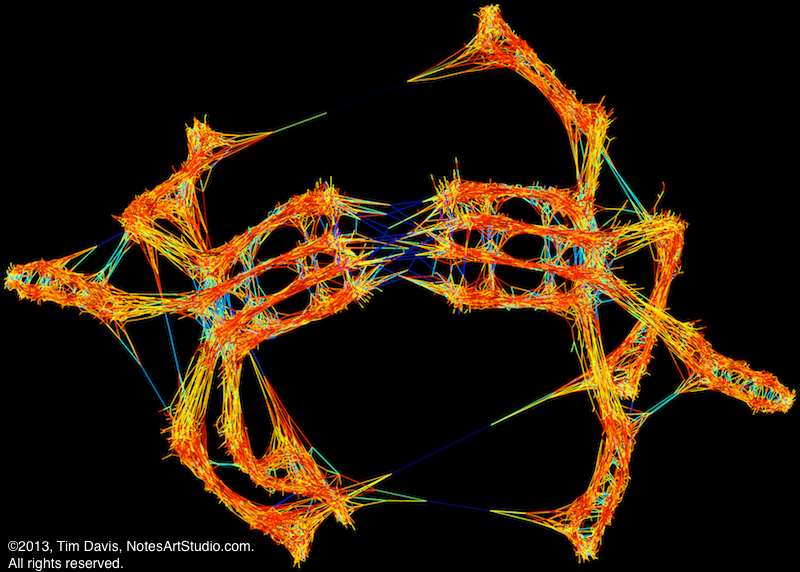 One of his hobbies involves the use of sparse matrices to translate music into visual art. Tim maintains the University of Florida Sparse Matrix Collection, which he and others use to test their sparse matrix algorithms. The collection includes web pages of beautiful visualizations of the sparse matrices created by a package called Graphviz. A London design agency saw the images, and contacted Tim to see if music could be visualized. Tim hadn't done music before, but agreed to give it a try. The agency liked what they saw, and commissioned Tim to do the artwork for the London Electronic Arts Festival held last November. His artwork appeared as the theme artwork for LEAF 2013, appearing on posters and billboards around London last fall, and still appears as the background on the agency's web page today. To produce this art, Tim created an algorithm in MATLAB which processes the music via the FFT and then translates the frequencies into a MATLAB sparse matrix. 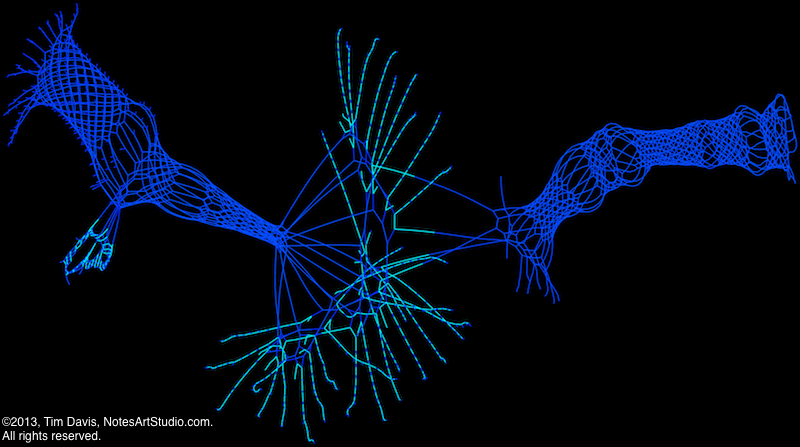 The matrix is then drawn via Graphviz, a force-directed graph visualization package. To generate the visualization, Graphviz places electrical charges on the nodes and springs on the edges, and then does a physics simulation to find a low-energy state. The color reflects the notes, where low frequencies are blue and high ones are red, using the MATLAB jet colormap. Link to gallery image. Link to music. Metastaseis is a complex orchestral piece by Iannis Xenakis, a composer and architect who translated his architectural thoughts of space and structure into music, relying heavily on mathematics and algorithms. In Xenakis' preliminary sketches for Metastaseis, lines and their intersection in space form hyperbolic paraboloids, which he translated into musical notes and chords. Xenakis described his process as "vision -> rules -> works of art." He describes an inverse path as "rules -> vision." 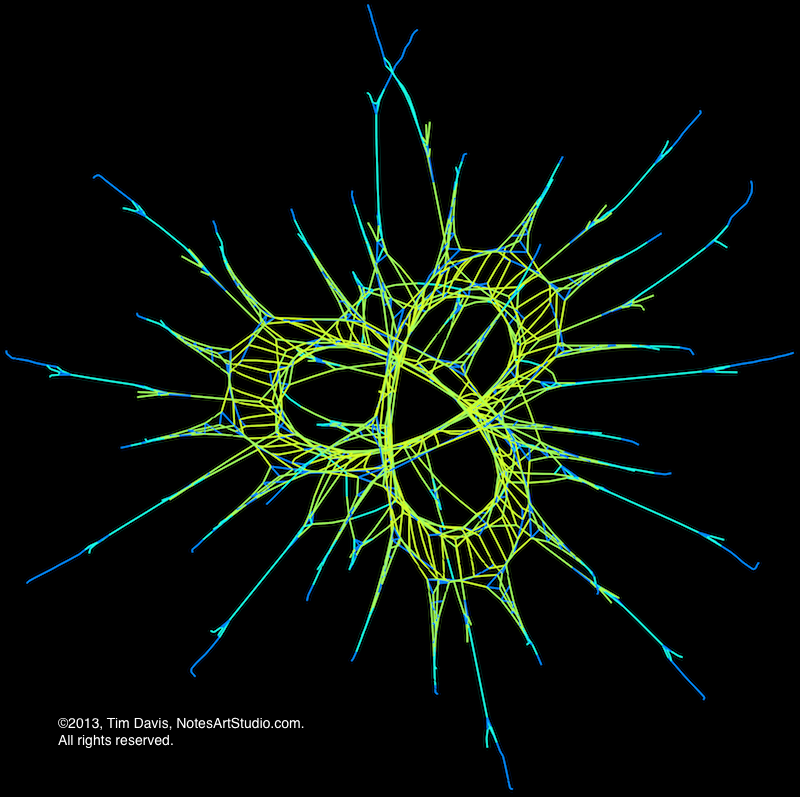 Tim's visualization completes Xenakis' inverse path by using algorithms to create visual artwork from Xenakis' music. Blue Monday is by New Order, a British rock band that combines new wave and electronic dance music. Tim's rules do not specify "build a mesh here." Instead, mesh-like structures arise because of the repetitive bass notes that appear in electronic music. Link to gallery image and music. Electrodoodle is a piece of electronic music by Kevin Macleod. Like Blue Monday, this piece of music has lots of deep repetitive bass notes. Morning Has Broken is a hymn written in 1931 by Eleanor Farjeon who set it to an old Gaelic tune. This version is arranged and performed by Cat Stevens. Tim created this piece for Iain and Di Duff. Iain's work appears in MATLAB as the algorithms underlying LDL and backslash when A is sparse and symmetric indefinite. Tim's visualization of Bach's Toccata and Fugue in D minor (BWV565) reflects the tensions in this complex orchestral piece. All these images are reproduced here with Tim Davis's permission and may not be copied. For many more images and information about Tim's work, see NotesArtStudio.com. Cleve, thank you for this nice overview of Tim's music art. I haven't looked at his own site yet, but he mentioned it when he was here for SVG70. We definitely missed you then. Since music proceeds in time, I'd like to get an understanding of where or how the 2-D images represent time. Bach's Toccata and Fugue is really an organ piece. There are orchestral arrangements, but they seem far removed from the real thing. (You can't beat an orchestra that includes an organ -- e.g. the Saint-Saens organ concerto -- but the orchestral Toccata and Fugue doesn't.) I hope Tim chose the organ version.